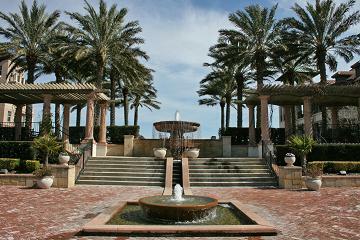 Palencia is one of the most beautiful communities in St. Johns county. This stunning community is nestled along the west bank of Florida’s Intercoastal Waterway and is known for preserving the natural beauty within the community while providing abundant amenities, and majestic home sites. Palencia spans 2,350 acres providing a variety of home sites, office and retail space along with over 33 acres of parks and trails. 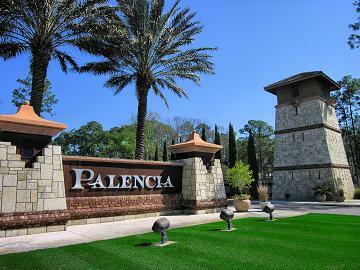 Palencia is a large community divided into smaller clusters of homes centered around town square and neighborhood amenities. There are currently five communities, each with their own unique beauty and magnificent views, potential residents can explore each community to see which one is the perfect fit for their future home site. There are a couple of shopping centers at the entrances of Palencia. At the north side entrance you will find a Starbucks, Burger King and a variety of shops and restaurants. On the South side entrance there is a Dunkin Doughnuts and a convenience store making it easy and convenient for residents to grab a bite to eat or do some shopping without traveling far from home. 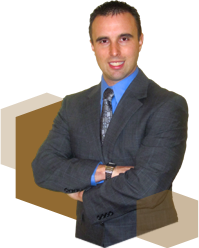 Palencia also has an extensive and impressive list of amenities that go far beyond the ordinary. 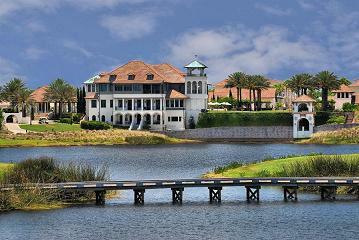 There is the Palencia Golf Clubhouse that includes shopping, dining, banquet facilities, and a public café. The recreation possibilities arelimitless. Choices include: Championship golf course, ten lighted tennis courts, soccer field, basketball court, three baseball diamonds and not to mention a pirate ship playground and four swimming pools, one with a water slide, perfect for entertaining the kids. There are eight miles of multi-use paths and a network of parks and playgrounds. While the kids are busy with any number of activities, the adults can head to the state of the art fitness facility and catch a fitness class, squeeze in some cardio or get a personal training session. Residents also get to enjoy Palencia’s own private island which easily reached by a mile worth of board walk over the intercoastal waterway. The island has areas to picnic and a fishing pier so residents can enjoy a relaxing day watching wildlife. No matter what your mood or energy level Palencia offers a variety of amenities and activities to accommodate them all.